Yowza! Baconize me Mom…….I’m ready! I can ALMOST (not quite) smell it frying in the pan………….WOO HOO. I really do look forward to weekends when the frying pan comes out of the cupboard and shortly afterward the refrigerator door opens and I hear the drawer where the bacon lives open and close. I know my sounds – yep I sure do. THAT’s a sound I know quite well. Mom makes other stuff for her and Dad on Bacon day – you know like eggs and toast and all that stuff…………but for me? Bacon does it. Now while I’m enjoying my bacon and you’re listening to me crunch crunch crunch away – may I say that if you haven’t done so, you MUST visit Cat Forsley’s blog so you can see the fabulous video she put together with all of you who wanted to be in it and sent your info to her!!! I’m not sure she was able to put EVERYONE in that wrote to her after I told you about it, but if she could, she did, and it’s fun to see all of us. Just click on her link below to check it out! THANK YOU MISS CAT FOR MAKING US STARS LIKE YOU ARE!! Now, if you’ll excuse me, I’m going to see if by any chance Mom or Dad might possibly have accidentally on purpose dropped a bit more bacon into my dish! YAY for Mr. Stripey Pants! We know good stuff when we smell it! Dinner? Dinner? Oh that’s right – you’re on the other side of the world aren’t you! 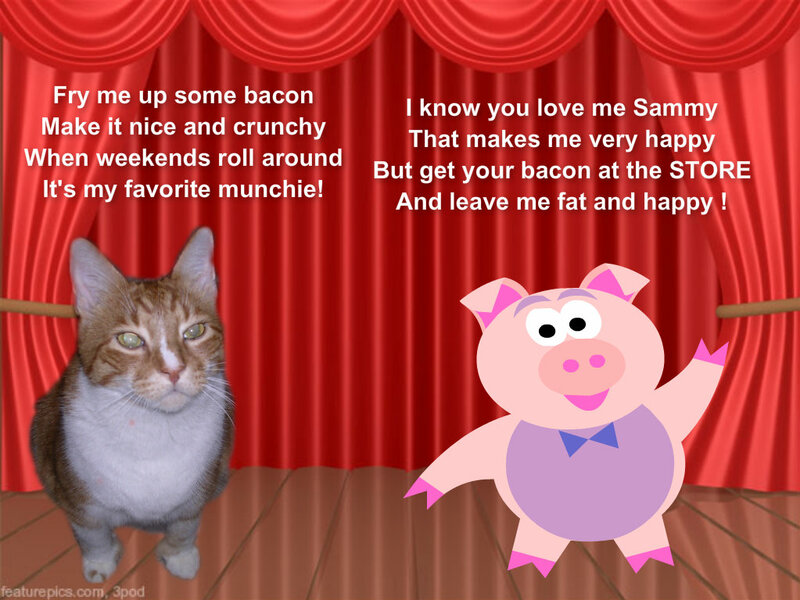 Well, I hope it was as yummy as my bacon is this morning……Miss Cat did a fun video didn’t she? She loves animals – can’t say that I blame her – we are rather adorable!!!! Happy Saturday! Hi Fozziemum!!! Pot stickers sounds yummy – My Mom and Dad have had those before at a restaurant in town but she’s never made them herself or I’d probably try one even if it was just because they have such an INTERESTING NAME!!! HAHAHAHAHA Miss Cat really does adore animals and I’m happy I’m on her “adore” list too! Oh I like the idea I’m on everybody’s ADORE list……yesireeee I DO like that! Enjoy that bacon, Sammy! Wasn’t that a cool video?? Hi Sundae! I’m getting baconized right now! I thought Miss Cat did a nice job on the video – it’s fun to be in the movies isn’t it???? Sweet video! I think you were the perfect choice for the first frame, Sammy! Enjoy your Bacon Saturday! I don’t care for human foods at all BUT Admiral, the one who came before me LOVED it. She would come from whereever in the house the minute it started cooking. Mom loved that. She shared with everyone here! That was super sweet of your Mom to do “share-sies” with everybody when she cooks. I am usually curious and will stay NEAR the kitchen and sometimes I THINK I want to try something Mom’s making but rarely do I really want it……EXCEPT FOR BACON. That’s it for people food……and I DO love that! What would Saturday be without bacon?! Not worth opening the eyes and getting up. Oh Miss June, you’re EVER so right! Thankfully my parents came through with the “good stuff” this morning……..or else I would have had Mr. Pouty Face on all day! Enjoy your Saturday Sammy and your bacon! Fingers crossed for rain for you. We got a little more around midnight. We are going to see the great nephew today! So we will have a nice drive. It is 58 this morning! No sign of rain YET Miss Pix…..maybe when you sent it to us you forgot to put a stamp on it???? Maybe it’s just taking its time getting here???? I’m sitting by the window with my eye to the sky though……Hope you have fun visiting that cute little great nephew of yours – on a beautiful day, a drive through the country is PURRRRFECT! Hi Sammy! Thanks so much for telling me about Cat! I am honored to be a part of that video cause of YOU!!! Go and check it out, your mouth will be watering in no time! Oh Cody I’ll check that blog out ASAP – you know me – anything that has even the possibility of being about my beloved bacon is something I’m ALL FOR! I’m glad you like Miss Cat – I think she’s a very special lady with a HUGE talent and love for animals. I’m so glad you sent your picture in for the video she did – isn’t it cool to be a STAR? Think that means we’ll have loads of beautiful girl kitties starting fan clubs for us???? HMMMMM????? I wish i could get help like yours. Bacon every week – that sounds fantastic. Oh Zena, it IS fantastic……even though it’s just a little taste for me, I do love it SOOOOOOOOOOOOOOOOO much! Easy my friend, I HIGHLY recommend bacon. Seems I’m not the only one who is a baconbuddy either because lots of our blog buddies are giving it a try since I go on and on and on (and on) about it all the time. It’s just plain GOOD. I really lucked out today though because not only did my parents have bacon for breakfast (which means I had some), my Mom just finished making a “BLT” for herself (bacon, lettuce & tomato with mayo sandwich) and that meant I got to smell that fabulous aroma TWICE IN ONE DAY! As for Miss Cat’s video – pretty cool huh? Does this mean we’re going to have fan clubs with pretty ladies and stuff?????? Say – maybe this is how you’ll meet your TRUE LOVE – – – some gorgeous weimie-girl will see the video and visit your blog! Let’s hope so. pee ess…..I suggest you sneak into the kitchen and add “BACON” to your Mom’s grocery list…..Really! Easy my friend I like the way you think! Eau de Baconette would be a BIG HIT I think!!!! Brilliant!!!!! Yay it’s bacon day! Have a great weekend Sammy. Hi Miss Sue! YES – bacon this morning was totally delish and there’s a rumor going ’round that my parents are gonna have a bacon bonanza tomorrow so I’ll be tuned in for that too! Happy Caturday! Hi!!! Gosh it’s nice to meet all of you……….here I am in a one-cat household and you’ve got TONS of “built in” friends at your house. How way cool that you heard about us from Miss Caren and Cody – my buddy. I’m on my way NOW to come see what you all are up to at “your place”………! As you see, I’m a huge fan of bacon but my Mom and Dad ONLY eat that on weekends so I have to try to be patient until then….which isn’t easy…..trust me on that! You too Cat! It’s gorgeous here so we’re being “outsiders” today – enjoying the shady front porch and yard (oh and bacon too!). I’m so behind and haven’t been over to cat’s yet. Going over there now! The video is GREAT – you look so beautiful Misaki (that’s because you ARE beautiful of course!!)……. Hi gang! We got that rain too – we sure did need it and it lowered the temp considerably! Mom mowed our weeds lawn this morning so the timing was purrfect. Looks like we’re all in for a cozy night! Sorry you missed the video opportunity but Miss Cat is going to do another one in September. WOO HOO. As soon as I hear from Miss Cat that she’s ready for ani-pals to send in photos, etc. I’ll be sure and put it in my bloggy!!!!! This made me smile. Nice to see you, Sammy. I’ve missed you. Always nice to see you too……I’m glad I made you smile. I was sad to hear about my beautiful friend Tiara…..I’ll miss her green eyes too. Just to be serious for a moment, here there have been all sorts of horror stories and revelations about the ghastly conditions pigs are reared in in Ireland and Italy among other countries, so a plea; if you do want to eat bacon, please could you check that the animal has been reared in humane conditions. This site might help you http://www.ciwf.org.uk/. Thanks Isobel…..we actually get our bacon locally from a farm and the piggies there are treated quite royally – but this is a GOOD reminder for everybody because often farm animals are kept in deplorable conditions. Quite sad. I love bacon more than anything!! Recently, a friend told me about baking bacon, and I’ll never go back to frying! It’s a lot better for you to bake it than fry it……BUT since my Mom and Dad are usually frying something ELSE along with it they just fry it. My Dad likes his egg fried in bacon grease! (I’m sure his arteries love it too……………NOT!). I think you should go on strike until the bacon arrives…yep….nobody should be without bacon – it’s criminal!!!! Me had sum tuna-tuna today n me iz as happy as you!!!! Hi Nylablue….bacon is as delish to lick as it is to munch on so GO FOR IT GIRL!!!! That’s true – it’s built in protection to keep you from eating bad stuff if you don’t have teefies and just have to lick stuff. Who knew losing your teeth could actually be HELPFUL?!! Oh Mollie I’m so happy your Mum gives you a lovely treat like BACON on the weekend! Nothing like it is there?!?!?! Bacon day is a happy day!! Austin my good buddy, you simply MUST ask your human to get some for you to try……a guy NEEDS bacon in his life – trust me!